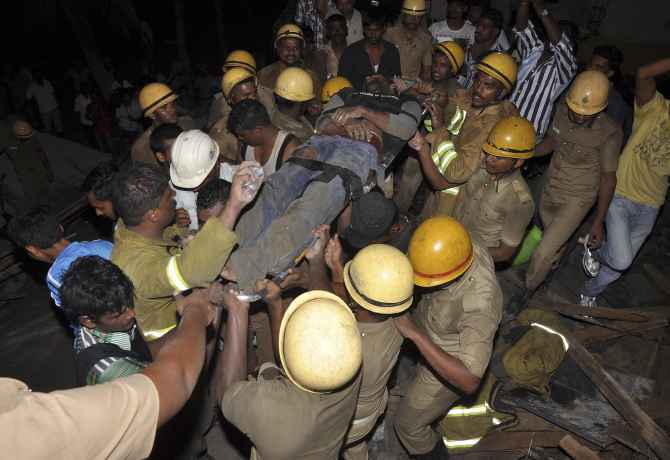 Prakash Rout, a young plumber hailing from Odisha, spent 72 agonising hours under the rubble of the collapsed 11-storey building near Chennai without food or water. Although Rout had a miraculous escape as he came out without a scratch on his body, he regrets that his childhood friend and colleague wasn’t as lucky as him, reports S Saraswathi. It was on Saturday, June 21, that Prakash Rout, a poor plumber from Odisha, landed in Chennai little knowing that within a week he’ll go through the most challenging 72 hours of his life. 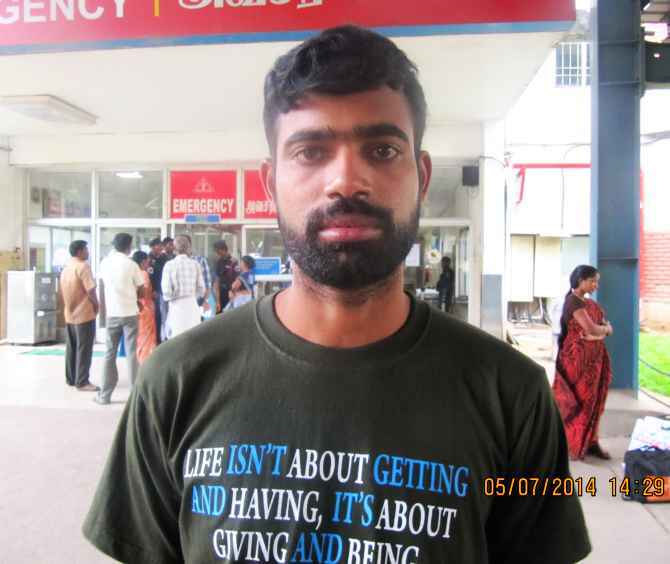 Rout, 28, who hails from Odisha’s Kendrapara district, joined his friend Amar, also a plumber, working in an 11-story under construction building at suburban Porur near Chennai. And exactly a week later, on June 28, disaster struck. The fateful day dawned bright and clear and was getting hotter by the hour. At around 4:30 that evening, however, it suddenly got ominously dark and within minutes the rain started pouring amid loud thunder and lightning. The power went off and the workers at the construction site were left in the dark. Less than an hour later, like a graphic scene straight out of a movie, the near-complete structure built with steel and concrete just tumbled down like a pack of cards. Sixtyone people lost their lives in the mishap as Tamil Nadu Chief Minister J Jayalithaa ordered a special investigation team probe into the incident. And if that was not enough, 11 people lost their lives on Sunday as a compound wall collapsed on adjacent huts in Tamil Nadu’s Tiruvallur district. It was on July 5, another Saturday, that Prakash was discharged from Sri Ramachandra Medical Centre in Porur where he was undergoing treatment. “My train is at 8 pm, I am leaving for Odisha today,” he said as we caught up with him outside the hospital, barefoot, clutching a small plastic bag with just some medical reports and a few belongings. Many government officials from the state health and revenue departments were present guiding him and a few other survivors who were being discharged from the hospital that day. Vehicles were arranged to take them to the bus terminus or the railway station to leave for their respective villages. 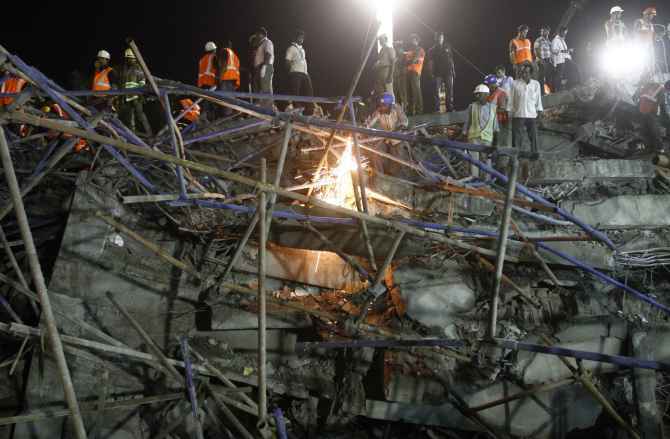 Prakash was among the last few survivors to be rescued from the giant pile of rubble at the ill-fated construction site 72 hours after the building collapsed. In this interview with Rediff.com, just outside the hospital, Prakash talks of his ordeal that lasted 72 hours in total darkness, having no hopes to survive, and drinking his own urine to quench his unbearable thirst. I reached Chennai on a Saturday, this horrific incident took place on a Saturday and now I am leaving city also on a Saturday. It has been just two weeks since I arrived here and so much has happened. I lost my childhood friend Amar. We grew up together and had big plans for the future,” Prakash says. Prakash informs that it was Amar who asked him to join him in Chennai. Amar Rout's body was flown back to Odisha where he was cremated by family members on the very day Prakash was rescued. There was a huge mix-up and Prakash too was presumed to be dead. Two bodies identified as Amar and Prakash were flown out to Odisha, where family members had gathered at the Swargadwar in Puri for the last rites. But even as the mutilated bodies were being handed over at Odisha, Prakash was rescued and the family was immediately informed. The grieving family was overjoyed to hear that their son was alive and well. “It was only after I spoke to them did they believe that I was safe. My father wants me to return home immediately,” says Prakash. For 72 hours, Prakash remained in complete darkness without food or water. He was so thirsty that he was eventually forced to drink his own urine to survive. Ironically, it was his thirst that probably saved his life. “Amar and I along with two others were working on the seventh floor in an apartment facing the front of the building. Some time after 4 that afternoon there was loud thunder, lightning and heavy rains. After a while the power went off. It was quite dark and we were unable to continue with our work. “I was thirsty, so I walked into the opposite flat, which faced the back, to drink some water. Amar and the others remained in the flat. “I had barely reached the flat when I felt a tremor. My immediate thought was that it was an earthquake. I crouched against one corner of a wall and waited for it to stop. But there was this extremely loud rumbling noise and the entire building started to tremble. It was a totally unbelievable moment; I could barely understand what was happening. “I remember thinking that since I was going to die anyway, I should probably jump off the building. I even called out to Amar, but just like that, within a blink of an eye, I saw everything collapse all at once. I felt myself going down with the entire structure, which just tumbled down like it was made out of dried wood. “When everything settled, I found myself enclosed in a small area about 3 feet wide. One huge slab above my head had fallen diagonally leaving a small space in between. “At first I was terrified, I kept screaming for help. I was afraid that no one would hear me and I would probably die here. “But after a few hours I could hear noises above and I calmed myself. I slowly cleared some of the small pieces of debris lying near me and made some more space. I felt that I would be rescued soon, but the nightmare continued. “Though I never felt hungry, I was extremely thirsty and finally forced myself to drink my own urine. I dozed off and on and had no idea how much time had passed or whether it was day or night. Sometimes when I heard loud noises or machines being operated overhead, I was frightened thinking something might collapse over my head. “It was only on Tuesday afternoon that I could establish communication with the rescue team. I could see a distant light and hear voices more clearly and much closer. “At first they spoke in a language I could not understand, but with my voice, they identified my location. My first request was for water. They inserted a small pipe through an opening and supplied the water. “I have never ever felt so happy just drinking water. “Once I had the water, I felt much better. In fact if I had a supply of water, my ordeal would not have been so bad. “Now I was totally confident that I would be rescued soon. They tried to get me from above, but there were some huge slabs that were very difficult to cut through. They finally reached me laterally. It was such a huge relief to be out in the open. I was totally unhurt and would have happily walked out had they let me. But the rescue workers were cautious and immediately sent me to the hospital where I have been these last few days. “So many labourers have lost their lives while I did not even have a small scratch on my body. It is truly God's grace, a miracle.